Before I share today’s post, I have to say how much I appreciate the discussion that has started on yesterday’s post about personhood. I very much appreciate reading about others’ views and having the opportunity to discuss and explore them. Thank you! Chris may be on vacation for two weeks, but I am working away. Not only have I spent many hours this week thinking and reading about, then writing yesterday’s post, but I’ve also been doing quite a bit of “real” work too, both for Papoose and web design/development. In the wee hours of the morning last night (this morning? 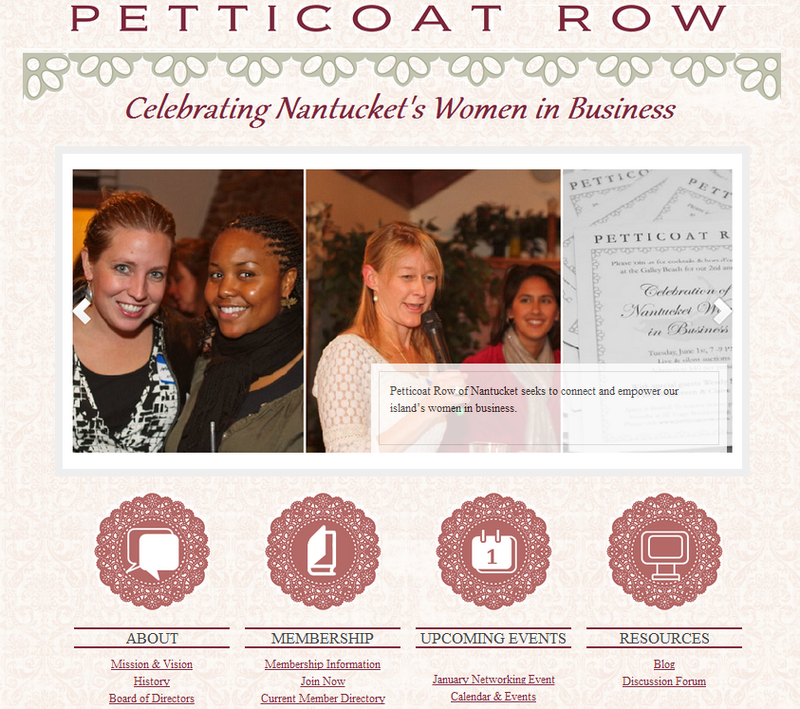 ), I finished a website for Petticoat Row, a Nantucket business women’s association. I was so excited to work on this website. Not only was it fun to try my hand at new layouts and designs, but I also was happy to help out such a great association. Petticoat Row of Nantucket seeks to connect and empower our island’s women in business. They offer monthly networking events with great speakers, workshops, and the best support you can imagine for someone starting or managing a business. The founders of Petticoat Row have been incredibly supportive of me and my business ventures: besides asking me to build their website, they also have offered great support and advice for Papoose, and I was honored to speak at their November meeting. This evening was Petticoat Row’s January networking event; as I sat in a room surrounded by upwards of 50 or 60 women, all of whom had come together to support one another and celebrate our efforts, listening to the speakers, I was so thankful to live in this community of women supporting women. One of the speakers, Lisa Wisentaner of Nantucket Cycling Studio was amazing — she was positive, empowering, and infectious. Listening to her, I thought I could do anything. I was most taken, though, about her comments regarding balancing business and family. Lisa said that she does what she needs to do to make it work, even if it means going to bed after 11 p.m. and getting up at 4:30 a.m. As I burn the midnight oil building websites (which I enjoy doing but mostly do for the income) and blogging (for both enjoyment and hopefully eventual financial gain), and as I try to work on/for Papoose (which so far makes me nothing, but which I very much want to do) whenever I can cram it in, it’s nice to know that I’m not the only one coming up with creative strategies for making it all work. All the time, I wonder how I could possibly have started so many things and how I’m actually going to balance them all as I run about my days with Nora. Somehow it makes the crazy juggle a little easier when I get together with a room full of women who are all doing the same thing. The website looks fantastic Amber! Good luck with your business–looks like you’ve found a growing niche in your community which enables you to work from home–way to go!!! Are you enjoying Chris’ vacation time? This might be an opportunity to do something special together as a family or to go somewhere. Have a great week! We are very much enjoying having him home. It’ll be hard when the restaurant re-opens, both because we’ll miss having him around and because it will make it harder for me to work during daylight. The next few days I will be working trying to get as much done as possible before I don’t have him home to help. Hi Amber! I just wanted to let you know that even though I don’t know you – your blog has really changed my perspective – especially as it relates to Green Living. Also is it true that you can’t use any diaper cream on cloth diapers? Does Nora soak through her cloth diaper at night? Right now we use special “night” diapers, and they are DEFINITELY full by morning. What brands of diapers do you like best? Any other resources you have on cloth diapering would be greatly appreciated!!! I probably will still use some disposable diapers when I’m out, but I’m looking forward to a transition at least with some of the changes. Plus I already have TONS of cloth diapers (we used them as burp cloths for the first several months). Thanks for your perspective and I just wanted you to know that you are making a difference beyond even people that you know. Thank you so much for your kind and thoughtful comment! It means a lot to hear that my blog is helpful to others. Did you see my two posts about cloth diapering? You can read them here and here. We have tried a lot of different kinds of diapers (mostly because I bought as many used diapers as I could), but I decided that my favorite style are pocket diapers, especially with an older baby or toddler who is wigglier or has a bigger bladder. Right now, we only use pocket diapers on Nora (nights and naps). We use both Bum Genius diapers and Tiny Tush. They are incredibly similar, although I slightly prefer Tiny Tush because of the way the pocket is sewn, because the second insert is thicker, and because they are made in the US. The difference is negligible, though. Bummies are really nice, I bet you’ll like them; we used their covers with contoured diapers in the newborn stage and I will definitely go back to them with the next baby. They’re less bulky on a little baby than the pocket diapers.The thing I can’t emphasize more is how much better snaps are than Velcro. If you can avoid Velcro, your diapers will have a much longer life. We used the disposable liners sort of infrequently. If they were wet, I would wash them a reuse them so I didn’t have to go through a lot. Really, though, the liners were for the babysitter so she could easily flush. Do you have a diaper sprayer? We stopped using the liners when we realized how effective and easy the sprayer is (and now taht we don’t have to spray diapers, we use it to rinse out her potty seat). Nora has never been a huge night-time wetter, so we haven’t had too many problems since we switched to the microfiber. We started out using contoured cotton diapers because I wanted natural fibers, but even with doublers they were less absorbent. At night now she wears a pocket diaper with both inserts and is fine. Leaks are very, very rare. The general recommendation is not to use diaper cream, however if you need it you should. Nora had a very persistent bout of a yeast rash for several months after her first birthday and we used diaper cream with our cloth diapers. I have never noticed a difference in absorbency, however there are some slight white stains on a couple. If you really need to use the cream or are using a lot, you can use a barrier such as a disposable diaper liner or a piece of fleece between baby and the diaper to prevent staining. I just read the posts. These are great. My daughter will be starting at a licensed home daycare right near my house, and they were totally fine with cloth diapering! They cloth diapered one child that recently left the daycare, and I think those parents were way more into it then I will be. I loved yours and other tips from the 2 posts and found them to be very informative. I’m glad I only ordered 3 Bummis because the Tiny Tush’s sound like they are perfect (my daughter is tiny at 11 months she only weighs about 17 lbs), so I like the fact that the snaps will make them very adjustable. Plus I really do plan to use our old burp cloths (Gerber cloth diapers) as actual diapers, and we have about a dozen of those. My husband laughed out loud when I told him this, but I know that as long as I tell him what to do, and do the initial heavy lifting he will be on board. I’m glad to have had her at home with Grandma/a babysitter for the first year, but I’m also thankful to be starting a diapering transition. Grandma would NOT have been on board with cloth diapering, so the transition is well timed! It’s hard being a working mom who works full time (but I work from home which is great!). I still need child care because my work isn’t totally flexible (I’m in a lot of meetings from 8-5), but it is a great benefit to feel closer to my little one. Thanks so much for all your perspective!